numbmom: Who made up the rules for acting like a girl? Who made up the rules for acting like a girl? I came across a class picture from my nursery school yesterday. Held within the frame, I found all the answers. The more I stared at that grainy photograph, the more I learned about life, about mothers, about children, and about me. In that picture I saw myself exactly as I still am today. I have always been this person I am, even when I was a 4-year-old posing reluctantly for a photograph in an attic classroom of our church parish house. There I am, the only girl not in a dress, no bow in my hair, the botched DIY haircut. 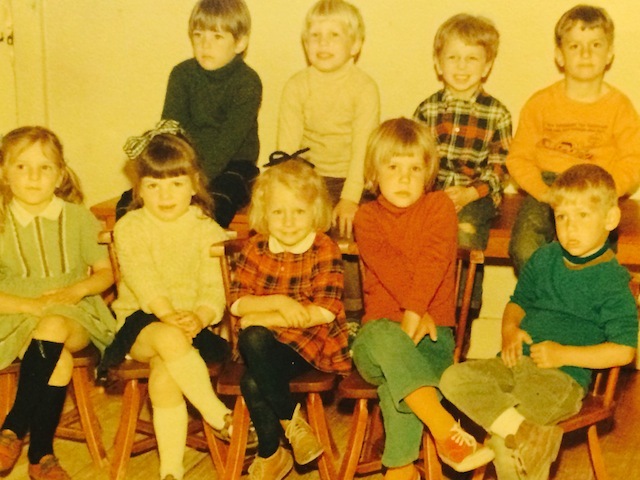 There I am, not remotely inclined to smile for the camera man who, no doubt, had instructed me on how proper girls sit and what proper girls should do with their hands while they are sitting properly. There I am, much like today, slightly awkward and completely rebellious in the role of female. There I am, wishing I could put my foot up on my knee like the little boy–I can’t remember his name– sitting next to me, or slouch casually in the back row, like all the little boys behind me. It’s interesting to see that I was that person at such a young age. My rejection of conventional femininity, and conformity, was not something that happened along the way, because there were so many boys in my neighborhood, or maybe because I was the last of five– four girls and one boy– and my brother had wanted a little brother so badly he, and my dad, as legend has it, cried upon learning I was born. Just another girl. No it’s always been a part of my nature. And it’s even more interesting to consider just how extraordinary it was that my mother let me be me, despite the pressure she must have felt when faced with all those other, more conventional, little girls, dainty and ladylike in their dresses. Thank God for my saint of a mother who knew, and still knows, instinctively, how to honor and accept the diverse personalities and temperaments of all her children. And, as my children move through this life I hope I can continue to nurture those individual temperaments, including my own, with the same kind of grace that my mother does. It’s so clear to me, now, that we are who we are from the moment we come down and out of the chute: Esther with her wise independence and wanderlust, and Isla with her easy sociability and insatiable need to move to whichever beat is drumming in her heart. And the sooner we accept who our children are, the easier it is to get on with the good stuff. The important stuff: the living, and loving, and working, and playing. And just the being who we are. Without anyone telling us what to wear, or how to sit ,where to put our hands, or, above all, what to do with our bodies. Soooo what happened to the blogs at Babycenter? They don't appear to be there anymore. Yeah, where are the blogs? I don't go to babycenter anymore because I can't find them. I love this post. May we all accept and nurture our individual children as they need. If I'm not a night owl, and I'm no longer a morning person, what does that make me? This is where I write about being human and raising little humans and... oh the humanity. Oh yes, and returning to Vermont, after living in France. I'm taking reentry one day at a time with my eyes always fixed on the horizon.